This is a picture of our mother. 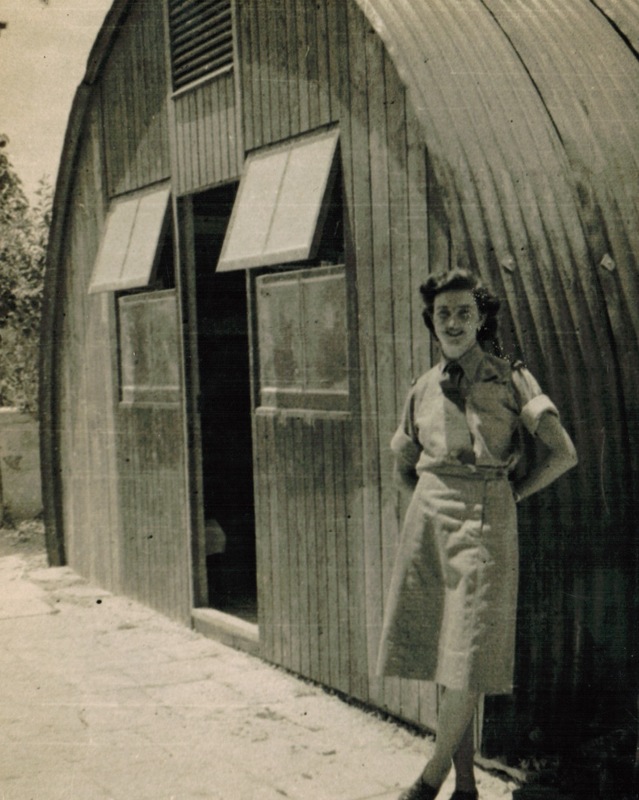 It was taken in 1944 in San Spirito, in Italy, when she was working at New Zealand army headquarters. During the Second World War, the role of women was changing. They began to do work previously done by men, in education, in health, in factories, in transport and on the land. These women often became more independent as their experiences took them beyond the lives of their own mothers. As the Irish poet Seamus Heaney said, ‘in a life the nucleus stays the same but with any luck the circumference moves out’. Not long before this photograph was taken, Neva was working as a secretary in Whakatane, her boyfriend was a champion swimmer and they spent their weekends at dances and up the east coast. When the war broke out her boyfriend joined the airforce and in 1942 he was shot down and killed over Benghazi, in Libya. The 24 year old woman in the photograph was partly recovering from the trauma of losing her best friend and partly taking charge of her life. Neva Yvonne Morrison was born in Gisborne on April 20th 1920. She had a happy, confident childhood and was bright and keen to do well. But times were tough and like many others she had to leave school during The Depression and find work. She learnt shorthand, became a virtuoso touch typist and could organise anything from a standing start. After the death of her friend, and partly as a response, she joined up for overseas service herself and after training in Wellington she arrived in Italy with the Women’s Army Auxiliary Corps. In September 1944 the administrative headquarters of the New Zealand division was moved to Senigallia on the Adriatic coast and Neva was promoted to a position working directly for Major-General W G Stevens, the commanding officer. The New Zealand division, which was sometimes called the 2NZEF or ‘The Div’ had built its reputation through tough campaigns in Greece, Crete and across North Africa and was now part of the arduous and apparently endless fighting up through Italy. Thousands had been killed. Many of the men around headquarters were on leave or were convalescing after being wounded. From them she heard of the battles and the terrible losses. She heard stories of men she’d known in New Zealand. Her sister’s fiancee had been captured in North Africa and was in a German prison camp. Her cousin had come through the desert campaign in the infantry and was now part of the fighting in Italy. Another cousin was a decorated pilot with 70th Squadron, where life expectancy was somewhat limited. She herself was the victim of a sexual assault and was mentioned in dispatches for her actions in defending herself. On the other hand, there were good friends among the WAACs, beautiful beaches, historic towns, and there were dances. An Australian pilot told me ‘Your mother was the best dancer in the New Zealand army.’ She also learnt enough Italian to make her way around and meet the local people, some of whom she stayed in touch with long after the war. As an allied victory became more inevitable the WAACs took some leave and hitched rides in army vehicles going to Florence, Sienna, Milan, Venice or Rome. Neva also went hiking in The Alps and climbed Mont Blanc. Throughout this period she kept a diary in which she recorded her experiences and which was later published as a book, ‘An Angel in God’s Office’. It was at Headquarters in Senigallia that Neva met our father, Ted Clarke, who was working there for a while after being wounded. Ted was from Wellington and was in the 7th Anti-tank regiment. He’d been at Sidi Rezegh, Ruweisat Ridge, Minqar Qaim, El Alamein, Tebaga Gap, the Sangro and Monte Cassino. Neva was keen not to become deeply involved with anyone but she and Ted got on well and had a good deal in common. Both had parents with strong roots in Ulster, both were interested in the arts, both had a gift for language and they shared a sense of humour. When the war finished Neva returned home via Britain and visited the place in County Down where her father had grown up. When she arrived at the railway station in Crossgar she approached a man with a horse drawn taxi. ‘Hello’ she said. ‘I’m from New Zealand and I’m trying to find the place where my father grew up.’ ‘Is that right?’ asked the man. ‘What was his name?’ ‘William Gibson Morrison’ replied Neva. ‘Right’, said the man ‘I’ll take you up to the house. I was at school with him. How is he?’ ‘He’s fine’ said Neva. And that night she slept in the bed her father was born in. A few months later she arrived back in New Zealand and was re-united with her family and friends. She quickly realised that she wouldn’t be slipping back into Gisborne and continuing her old life. She applied to go to Japan as part of New Zealand’s post-war presence in the region but was told they were only taking people who hadn’t had the opportunity to go to Europe. She took a job in the Prime Minister’s office in Wellington while she considered what to do. She and Ted had begun to spend some time together and he was thinking about the future. He had gone back to the job he’d had before the war with a national retail chain and had been appointed manager of the Palmerston North branch. After a while Ted was invited to go to Gisborne and meet Neva’s family and on a fine summer’s day in early 1947, in the garden of Neva’s parents' house in Sievwright Lane, where we later spent many Christmases, Neva and Ted were married. Here they are in Wellington as a young married couple, in step. Neva was a modern woman. She was intelligent, capable, talented, ambitious and very employable. She had travelled extensively in Europe at a time when travel was generally available to few. Ted was a very good retailer and retail was booming, so he was quickly marked out for bigger things in the company. I was born in 1948 and Anna in 1951 and Neva was a very good mother. As for many women, however, being confined at home and deprived of independent income or social contacts was a gender-specific restriction. Despite her love for her children, the role of housewife in Palmerston North during the 1950s was not going to hold Neva’s interest on its own. She got involved with the local theatre group and began to appear in plays. The local repertory attracted actors from other towns and for years afterwards I saw people in film and television productions, who had been in plays at the Manawatu Rep. Sometimes they babysat us while Neva was at rehearsals or during the run of a play; Ngaire Porter for example, who was from Napier and later played Irene in the BBC’s production of The Forsyte Saga' and Dennis Moore, who also went to London and became an agent and among whose clients were the members of Monty Python. They wrote a song about him in the manner of Robin Hood. It begins ‘Dennis Moore, Dennis Moore, Galloping through the sward. Dennis Moore, Dennis Moore, And his horse Concorde. He steals from the rich. And gives to the poor. Dennis and I are still in regular contact and despite the fact that he lives on the south coast of Devon, he still knows exactly what’s happening in Palmerston North. Sometimes I was roped into actual involvement in one of Neva’s plays. When I was about eight years old a boy called Bill Woollett broke his nose in a rugby match and I was blackmailed into replacing him at very short notice as Bob Cratchit’s son in 'A Christmas Carol.’ Another time I was prevailed upon to stand just offstage in some production Neva was in and hand various props to an actor called Colin Watson, who later became a successful sculptor in New York. Colin was rather a physical performer and would dash into the wings, grab the prop and then bound back onstage, slamming the door so that the set heaved and rattled and the notion that we were in Moscow, which was already in some trouble, was briefly abandoned altogether. Brooms would fall over backstage and we’d fumble about in the dark catching cups and bits of lighting equipment in case the whole of Russia went up. I also remember an actress called Bunty Norman singing a song called ‘Making Whoopee.’ She was pretending to be drunk and I was aware that I was learning about something by seeing it exaggerated. Neva was an encouraging and very amusing mother. She could talk about anything and if there was nothing much happening, she would help us to remember or imagine. ‘Who is this man?’ she would ask about a bloke walking up the street as we sat in the car ‘And what is he carrying in that bag? Onions? Fish? Has he murdered his wife and cut her up into very small pieces? And is that a limp or has he just got new shoes, and if so, should he take them back and get some the right size?’ She also took us to the A&P Show, to musical events, to visit her friends, to other towns and to shows by visiting artists. We went to the Opera House where we saw Joyce Grenfell, who was very funny and John Geilgud, who was very serious. Neva also bought a typewriter and she began to write short stories. There were other writers doing this in the Manawatu and they met regularly. They were often women and they sent their stories away to magazine publishers. Before the arrival of television, magazines were king and some of the best writing anywhere in the world made its first appearance in periodicals. I remember Alice Glenday who became a novelist and Joy Cowley, who lived on a farm on the way to Ashurst and had a husband who could do somersaults on the lawn. I was deeply impressed. Neva was sometimes ill in Palmerston North in the 1950s with various conditions we might these days see as at least partly psychological. The house was always clean and there was good food on the table but in emotional terms she was running on empty. She and Ted were drifting apart. Ted’s business was expanding and he was at work a great deal of the time. There are photographs from this period in which we look like a dust bowl family who have just lost everything in a tornado. In 1960 Ted was promoted to Head Office and the family moved to Wellington. He had a senior position with the company and was going well. Neva loved Wellington and her illnesses disappeared immediately. There was quite an active arts community and she joined the Wellington theatre groups. She also joined the radio drama cohort and appeared in plays for broadcast. She took singing lessons from George Scott Morrison. But mostly she continued with her writing. She sold a great many stories to magazines and for the next 50 years she published stories, memoirs, wrote book reviews, appeared in theatre productions and on radio. She published a novel, she wrote histories and she still had a weekly newspaper column in her eighties. During the 1960s the sound we heard when we came in from school, was the clackety clack of the typewriter. Neva would be perched somewhere in the house, often near a window where the light was good, and her fingers would be flying across the keys. She could type while looking at notes sitting on another chair or while saying ‘Hello boy who needs a haircut. How was school and why don’t you put the kettle on?’ There would sometimes be a small gathering of writers in the house. I came home one afternoon and had quite an interesting chat with a man in the kitchen. He’d been working as a teacher in Malaya when he was diagnosed with a brain tumour. He was given a year to live and he’d always wanted to write a novel, so he set about it without delay. He finished it, got it published and when he didn’t die, he wrote another one. He’d done this several times and had recently published a novel called ‘A Clockwork Orange’. His name was Anthony Burgess and he would live for another thirty years. Another man called John A Lee had published a memoir called ‘Simple on a Soapbox’. John had won a DCM in the First World War and had lost an arm. He’d been thrown out of the Labour Party for his socialist views and I gathered this had been a great scandal. He was a big genial fellow in a suit and he spoke in ringing tones in our small hallway as if he were addressing a large crowd in rather blustery conditions in open parkland. For a while our postman was James Baxter, who had a beautiful voice and would often come in for a cup of tea and a chat with Neva about what was going on in the writing world. I also remember going to Barry Crump’s house one day with Neva. I must have been about twelve and Barry was a hero of mine. I had first encountered him on radio, reading his early novels ‘A Good Keen Man’ and ‘Hang on a Minute Mate.’ It was the first time I’d heard fiction which caught the rhythm and tone of the New Zealand voice. Barry had overslept and was dressing as we arrived. He put a shirt on and pulled it down very firmly all around, which he referred to as doing the ironing. ‘Come in Neva’ he said. ‘I don’t think you’ve met my new dragon’. And we peered into the gloom where a slightly horrified young woman named Helen Smith was gathered among the bedclothes. My admiration for Barry was tempered by my recognition that Helen would possibly rather be in Philadelphia. In 1965 Neva became the New Zealand President of PEN, the international organisation of writers, and which over the next few years was instrumental in introducing public lending rights into New Zealand. In 1971 Neva and Ted were divorced and Neva got a job running an employment agency, bought a small house and got on with her life. Within a couple of years both she and Ted remarried. Neva moved to the far north and settled at Coopers Beach with her second husband Len McKenna, an American ex-Lockheed executive who adored the bays and beaches of the far north of New Zealand as much as she did. They drove all the roads, walked all the beaches and swam all the waters of the place they called ‘paradise’. Neva became the unofficial historian of the entire region and published books which are still among the best research ever complied about the early days and places and people of the far north. Neva was awarded the Queen’s Service Medal for this work and if you go to Mangonui, you’ll see the boardwalk named after her along the beautiful foreshore. Neva achieved a great deal in her life. She was creative, convivial, active and well-organised. She had a strong personality and wherever she lived she was surrounded by friends and admirers. She travelled extensively overseas and established strong contacts with her father’s family in Northern Ireland. She was interested in everything and she gave everything a go. She took up painting in her sixties. She was involved in a film in her seventies. She and the other participants went to Hollywood, met all sorts of people, had lunch with Phyllis Diller and enjoyed every minute of it. Neva insisted she wasn’t a feminist. Perhaps she thought feminism was inconsistent with motherhood and good housekeeping. Perhaps there were other reasons she didn’t like the label. It sometimes seemed to us that if she could see her personal history in terms of ideas rather than as narrative drama, she might have recognised the inequities she wanted addressed as those at the core of the feminist project. She fought some of them very early and some of them were very tough. Her grandmother had been a suffragist, had lobbied for women to get the vote and had served on local bodies in the 1890s. Neva’s determination to exist and succeed as an individual while providing life and support to others, is a powerful legacy. Perhaps she inherited this determination. She has certainly passed it on. In the last few years of her life, Neva lived in Hamilton, where Anna paid close attention to her needs as her capacities and her driving energy began to wane. In that time she loved receiving visits from her grand-children, her great grandchildren and from friends. Until that time Neva had an excellent memory and she always wrote things down. There were notes all over the house. Among some diary notes she made when she was in Wellington, she records a visit from Tom Seddon who lived up the road and was the son of Richard Seddon, who is still New Zealand’s longest serving Prime Minister. The Seddons had been great friends of the Beauchamps and as a young man Tom had travelled from Wellington to Rotorua one day and had bumped into Katherine Beauchamp, who is better known by her middle name, Katherine Mansfield. When Tom saw her in Rotorua, she was sitting in a park in the rain, under a weeping willow. She had come up to Rotorua with a man and it hadn’t worked out very well, which is why she was in a park. ‘But….’ she said to Tom. ‘I’ve written a marvellous story’. The story was called ‘The Woman at the Store’ and Katherine said it was about a woman she had encountered on the way up to Rotorua. ‘The Woman at the Store’ is a well known story and was published some years later in London. Katherine Mansfield scholar Lydia Wevers is interested in Katherine’s conversation with Tom because it was not previously known. It suggests that the work was formed in Katherine’s mind and was possibly written in some form, years before it was published. It is typical of Neva to have written down what Tom had told her, and to have caught even in a diary entry, the drama and value of a good story.